We're thrilled to announce our newest Field Partner, African Leadership Academy! Based in Johannesburg, South Africa, African Leadership Academy (ALA) is a two-year pre-university program for the most promising 15 to 19 year-old students from across the continent. The goal: To build a new generation of mindful and ethical African leaders (see these loans here). The school aims to produce well-rounded individuals through a holistic course schedule that emphasizes leadership skills, confidence, and communications skills in addition to academics. Most ALA students go on to attend top universities in the United States, Europe and elsewhere. Even after students graduate from the rigorous program, ALA follows them through college and beyond, leveraging its vast network of well-connected supporters and alumni to offer life-long mentorship services and connect graduates with career opportunities. ALA's admissions process is need-blind, meaning that it admits students irrespective of their socio-economic backgrounds. The reality, however, is that the majority of admitted students come from poorer areas, and require full scholarships to pay for the program. Some have never been to a major city, much less ridden on a plane before attending the academy. Full scholarships, amounting to $25,000, are structured as forgivable loans requiring students to return to Africa by age 25 and remain for a minimum of 10 years. If they don't return, they need to repay the scholarship with interest. Regardless, many students are already committed to using their educations to improve life in their home communities and countries. ALA identifies and recruits its students through a large and varied network of organizations and supporters, including church groups, NGOs, nonprofits, local governments, primary and secondary schools, and more. Receiving an average of 3,000 applications every year, the program can only accept the top 100. According to ALA's Director of Strategic Relations Frank Aswani, the admissions committee looks academic skill, but also a passion for Africa and the continent's future. Since its start in 2008, ALA has relied on donors for lots of things: to provide financial aid for its students, to pay staff, to maintain buildings -- and to provide student laptops for its campus library. But with more coursework going digital and computers becoming more central to education throughout the world, this isn't enough anymore. 1) Students without laptops are at a disadvantage in their coursework. They have to rely on library or shared computers that are often checked out, broken or overly worn. 2) Shared computers don't last very long given the hard use. This forces ALA to invest more resources that it could otherwise use to support teachers or curricula. 3) Computers are vital to elite educations at this point. ALA can't produce the next generation of technology-savvy leaders for the digital age with limited computing resources. 4) Students that purchase their own laptops with Kiva loans can take them with them when they go on to college so they don't have to worry about how they're going to afford the technology to keep up with other students at Harvard, Stanford, Princeton and the other schools where ALA graduates have landed. Kiva loans for about $500 each will help student borrowers purchase prohibitively expensive laptops upfront and pay back over the course of the next two years. They can earn these funds through a combination of campus work assignments, activities through ALA's Entrepreneurship Center, and more. Earlier this week, ALA distributed laptops to the students borrowing through Kiva. You can still support several of them on the site right now. It's rare we get to see the smiles Kiva loans put on kids' faces -- just one more reason we're so excited to be working with this remarkable Field Partner. Smiling ALA students and Kiva borrowers with their brand new laptops! We're also thrilled to see the Academy in the international spotlight for other reasons. 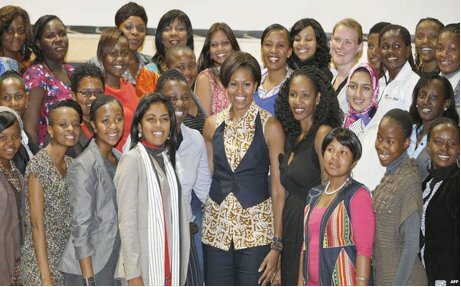 Recently, three young women from ALA were part of the delegation that joined Michelle Obama at the Young African Women Leaders Forum. This once in a lifetime experience touched the lives of attendees. One student, Esther Soma, said of the experience, "As she came to give me that motherly reassuring hug, I could not help but whisper a prayer that I would grow up to be a charismatic, courageous, powerful yet humble lady like her." Want to hear more from ALA graduates? 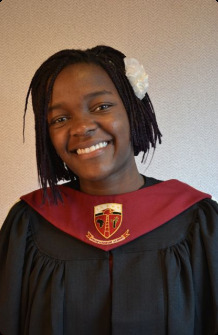 Check out the speech delivered by this year's Graduation Day speaker, Alexis Teiye. From Kenya, Alexis is passionate about youth engagement and is headed to Amherst College this fall on a full scholarship. Alexis Teiye in her graduation gown. You can learn more about ALA on its Kiva partner profile page. And stay tuned next week for a special interview with Frank Aswani, ALA Director of Strategic Relations, about what Kiva funding is making possible for future leaders. Have questions about Kiva's partnership with African Leadership Academy? Send them our way at blog@kiva.org.